Shapoorji Pallonji Group one of the leading brands in India with the robust presence in construction, home appliances, shipping, power, biotechnology, real estate, engineered goods and more. It was founded in the year 1865 by the Pallonji Mistry with the motto of presenting better India in all the segments. Mainly, the company is known for conceptualizing Mumbai’s grand landmarks such as Bombay Stock Exchange building, Taj Intercontinental, Hong Kong bank, Reserve bank of India and more. Shapoorji Pallonji has the major contribution in the repairs & renovation of Taj Mahal Palace that was dented at the time of the attack. Some of the Pallonji’s top notch projects are Jumeirah Lake Towers in Dubai, Ebene Cyber City in Mauritius and more, other than this, they have an investment plan in a deep sea port, hydro electricity and construction of roads in West Bengal. 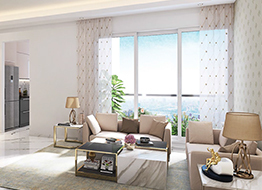 Recently, they have launched the project “Joyville Gurgaon” in sector 102, Dwarka Expressway, Gurugram which is one of the best affordable projects in Delhi NCR that opens an opportunity for the home buyers to come and buy their dream home with updated modern amenities to ameliorate the living standard.